Bruce Best, 92, veteran, husband, father, grandfather, and great-grandfather, passed away peacefully on the morning of Saturday, April 2, 2016 in Edmonton. Bruce will be lovingly remembered by his wife of 69 years, Jean; children, Laura (Bob) and Frank (Susan); grandchildren, Jennifer, Adam, Aaron and Lindsay; great-grandchildren, Ethan and Avery; brother, Doug; as well as by numerous relatives and friends. He was predeceased by his parents and sister, Eileen. Bruce was born in Calgary, Alberta and raised in Athabasca, Alberta until he joined the Canadian Air Force to bravely serve his country in WWII. 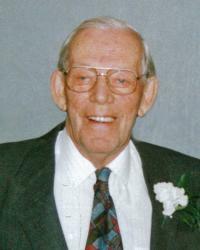 Bruce settled in Edmonton where he married Jean in 1946. It was there that they raised their two children and he had a successful career working for Imperial Oil. Bruce loved hockey and spent much of his free time coaching minor league hockey. Along with hockey, Bruce loved the horse races but most of all he loved his family. Bruce could always be found spending time with his grandchildren or telling a funny joke or story. He will be deeply missed by all those who knew him. As per Bruce’s request, a private family service will be held at a later date. In lieu of flowers, donations may be made to Jumpstart Hockey Foundation, jumpstart.canadiantire.ca.